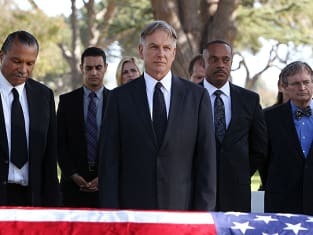 On the NCIS Season 11 finale, Gibbs learns from Vance that his father has passed away. While he goes back to his father's town to get his affairs in order, NCIS learns about a fire on a Navy ship that was deliberately set to mask an escape attempt by members of The Brotherhood of Doubt. An old enemy of Gibbs resurfaces and now Gibbs' life hangs in the balance. Rivera: I have freed the devil's men. And they hate you as much as I do. Sooner or later, they will strike. Gibbs: The only one who escaped was Lateef Mir. That's him. They let you watch TV in here? You should turn on the news tonight. You'll see his picture. Your picture. It'll be great. Permalink: Rivera learns of his complete failure. Gibbs: Cal, do something for me? Cal: Sure. Anything. You want me to lock the back up? Gibbs: I want you to take the store. Cheers. It's what dad would have wanted. Gibbs: Just do the work. Permalink: Gibbs hands over the keys.